A winter weather advisory is posted for all of Western New York starting overnight and extending into Wednesday because of the potential for freezing rain, the National Weather Service said. The advisory runs from 2 a.m. to 2 p.m. Wednesday. "Total ice accumulations of up to one-tenth of an inch expected," the weather service said. "Plan on slippery road conditions. The hazardous conditions could impact the morning commute." Winds could also gust as high as 40 mph. Warmer southerly air is forecast to be fed into the region ahead of an approaching storm system in tandem with an area of high pressure off of the mid-Atlantic, the weather service said. The setup will help to usher in mixed precipitation overnight. Forecasters were still trying to nail down the form it will come in due to complexities in that setup. "Continued warming in the lower layers will bring in sleet to the precipitation type with potentially some freezing rain across far western sites," the weather service said. Weather service forecasters were calling for freezing rain through about 8 a.m. before precipitation turns over to mostly rain. Temperatures are forecast to climb from the mid 30s by mid-morning Wednesday into the low 40s by the afternoon. Gusty south winds are expected. Some of the gusts could approach 40 mph, the weather service said. 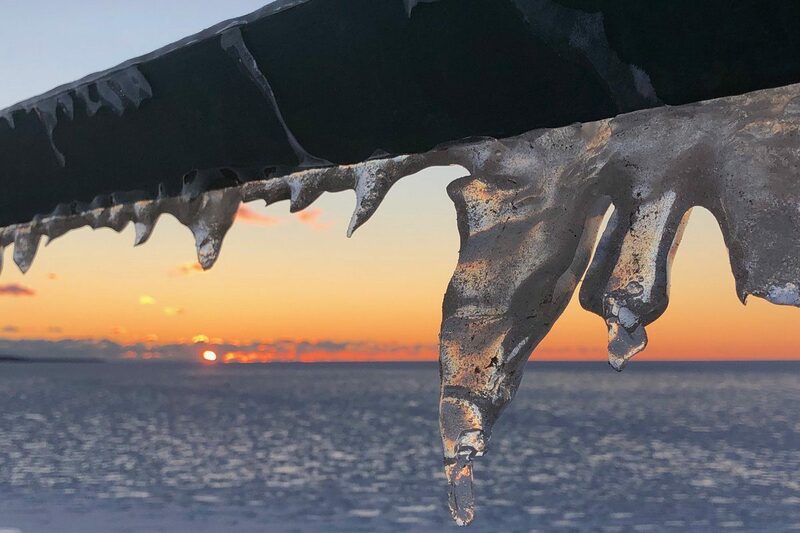 "The recent extreme cold spell and prospects of untreated roads may elevate the freezing rain potential with freezing rain on frozen ground surfaces that will lag behind in warming," the weather service said. As the storm system tracks through Michigan toward Quebec, rain is expected to continue through the day Wednesday into Wednesday evening. As much as one-half inch of rain is possible. Forecasters said any snow accumulations preceding the change-over to mixed precipitation earlier in the overnight hours should be less than 1 inch. But, as temperatures begin declining again late Wednesday, rain is forecast to switch back to snow overnight into Thursday after the first of a pair of cold fronts cross the region. "Rain showers along and ahead of the front will end as a brief period of wet snow or flurries as cold air deepens overnight," the weather service said, adding snow accumulations should be "minimal." Then, chances for snow showers are expected to stay in the forecast through the weekend, the weather service said. Daytime highs on Thursday should be in the low 30s but the mercury is expected to plunge back toward extreme cold. Overnight temperatures Thursday are forecast in the teens. Forecasters said they'll stay there during the day Friday and Saturday and drop into the single digits overnight. Buffalo's thermometer started its upward movements this morning. It dipped as low as 1 degree today but broke back into double-digit territory by 11 a.m. for the first time since 5 a.m. Sunday. Temperatures reached 20 degrees by 1 p.m. and were forecast to climb to about 30 degrees by midnight and 40 degrees by noon Wednesday.